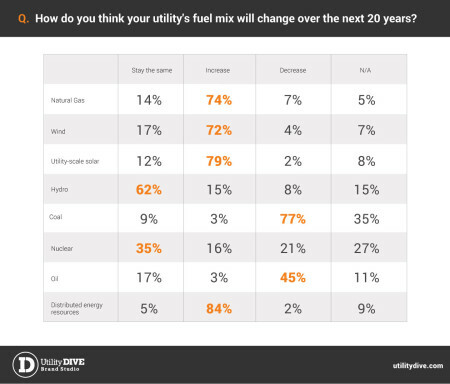 All told, 91% of more than 500 respondents indicated they expect utility-scale solar to increase significantly or moderately in their fuel mixes over the next five years. 77% see wind doing so, and 72% expect the same for natural gas. 91% indicated they expect either significant or moderate increases in distributed energy resources (DERs). Click image to enlarge it. Iowa leads nation in percentage of electricity from wind: Wind farm development also brings $11.8 billion to Iowa’s economy, by George C. Ford, The Gazette. More than 31 percent of in-state electricity was generated from wind energy last year, according to the U.S. Energy Information Administration. That marks the first time wind has supplied a state with more than 30 percent of its electricity. This entry was posted in Nebraska / Midwest News, NewsBlog, Research and tagged George C. Ford, Herman K. Trabish, Nebraskans for Solar, The Gazette, The State of the Electric Utility 2016, Utility Dive, wind energy development in Iowa on March 1, 2016 by Helen Deffenbacher.